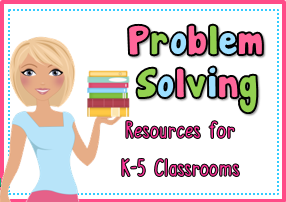 Need some Word Problems or Problem Solving Resources? Check out these fun resources for the K-5th Grade Classrooms. Here are 3 Word Problem Worksheets just for K-1st Grade Classrooms. Click on the picture below to read more about each one. 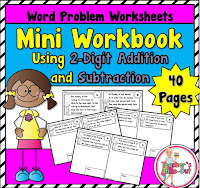 Mini Workbook using 2-Digit Addition and Subtraction has 40 pages of Word Problems. These worksheets can be cut in half and assembled into a mini-workbook. Use the worksheets as seat work, math centers, warm ups, exit tickets, morning work, or homework. These are great for those students that need some more practice using word problems. Here is a sample: Click here for a Sample Page. 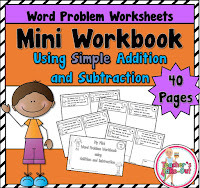 Mini Workbook using Simple Addition and Subtraction has 40 pages of Word Problems. These worksheets can be cut in half and assembled into a mini-workbook. Use the worksheets as seat work, math centers, warm ups, exit tickets, morning work, or homework. These worksheets use simple addition and subtraction skills. All word problems are written in word form. These are great for those students just learning how to solve word problems. Here is a sample: Click here for a Sample Page. 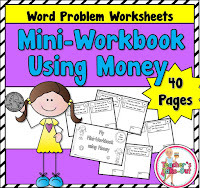 Mini Workbook using Money Word Problems is loaded with 40 pages. Assemble this Mini Workbook to use for seat work, exit tickets, morning work, small group, or homework. Use all year long to stay sharp with adding money and word problems! Combinations include 16 task cards. Students find the combinations that can be made on each task card. Choose a few task cards and a recording sheet to place in your math center. Change task cards out every few weeks. Or use them as part of your lesson. Use teams or partners to solve each set. These combination task cards are fun and engaging. 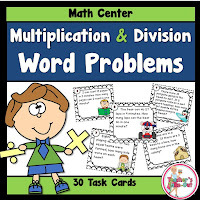 Word Problem Task Cards have students practicing multiplication and division facts. This pack includes 30 task cards using facts 1-10, recording sheets, and a game board. Use the task cards for a math center or for a 2-4 player game. Multi-Step Word Problems make learning fun! This pack includes 36 task cards. Task cards use a variety of addition, subtraction, multiplication, and division. Each task card requires at least two steps to solve the answer. If your students are needing more practice in multiple step word problems, then this is the pack for you! Word Problem Task Cards will surely have your student's attention. 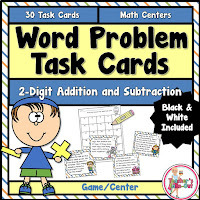 Each set has 30 task cards to solve addition and subtraction word problems. The blue set uses 2-digit numbers and the green set uses 3 and 4 digit numbers. Use these task cards at a math center or for a 2-4 player game. Elapsed Time includes 3 Math Centers. Each set has students thinking in elapsed time. Task Cards are in 5 minute intervals. The 1st set includes 12 task cards to figure out what time three activities will be. After students know the time for each activity, they can answer the 2 questions. 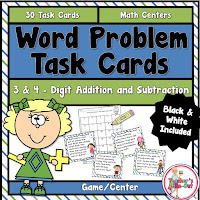 The 2nd set includes 24 task cards to answer word problem questions. The 3rd set includes 12 task cards to answer 3 questions according to the time on the task card. This Time Elapse set will keep your students busy and learning all year long. Menus for Math are loaded with word problems. There are 10 menus included that students use to answer questions according to the information on each menu. Students can also ask questions with information and data on each menu. They can give their question to a classmate to answer. These Menus will last you all year long! Great for your money unit or problem solving. 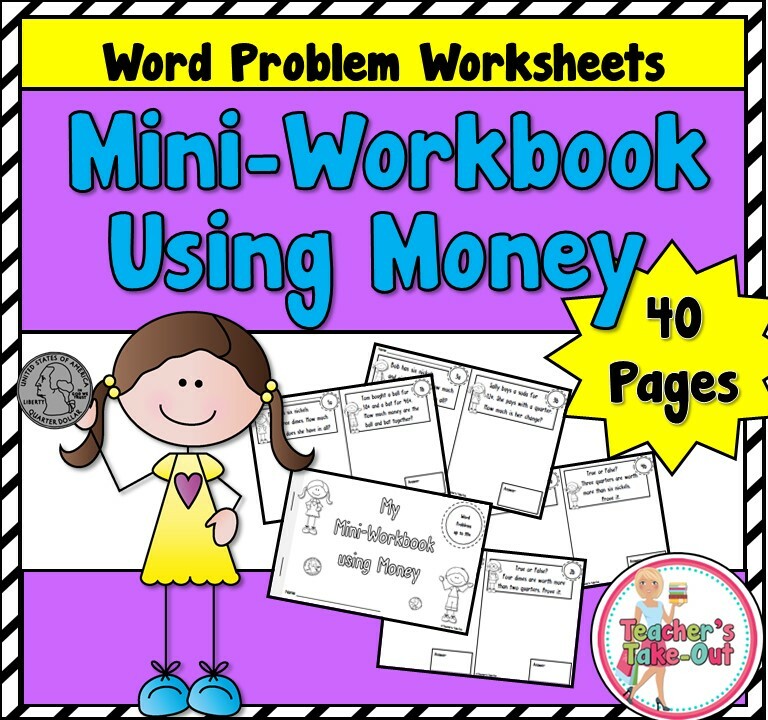 This pack is loaded with 20 Word Problem Worksheets using money. There are a variety of levels in this pack to fit the needs of your classroom. Students should be able to add 3 and 4 digit numbers and is able to understand the decimal point. If these are too hard, use calculators! Area and Perimeter is great for real word experiences. This unit has over 6 activities to practice both area and perimeter concepts. This one is one of my best sellers! Cooking up some Fractions include 30 word problems all about fractions. It has a cute restaurant and Italy theme to answer questions in real word situations. Students use their fraction skills for this one. This set is geared for 3rd grade thinking. Of course advanced 2nd graders can take advantage of some challenging questions. 4th graders can also benefit that might need a boost in their fraction thinking! Fraction of a Set includes 2 math centers. This set is all about finding the fraction of a set. Set 1 is for beginners that are just learning to understand this concept. Set 2 is little more challenging. This pack includes 45 task cards and recording sheets. Super Multiplication Worksheets has 50 pages all about learning multiplication facts 1-10. It also includes a few pages using word problems. Students will definitely be practicing their multiplication skills with this pack. 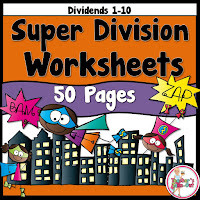 Super Division Worksheets has 50 pages all about division facts. This pack also includes some word problem worksheets. I also offer Discounts on all my products right here on Teacher's Take-Out. Click the link below to explore some new products.